My son and I created this personalized calendar for the summer. It was a super fun project to work on together, and he’s thrilled with the end result. The best part is that he’s actually excited about rushing over to the refrigerator to see what part of his day it is. I started by jotting down what we do on a daily/weekly basis. For the most part, it’s the same things every day: eat breakfast, brush teeth, get dressed, feed and walk the dog. Our morning and bedtime routines are similar. It’s what we do during the middle of the day that varies. Once I had captured our daily routine, my son and I searched for free clip art together. That part was really fun. He had a great time deciding which images looked most like our family. 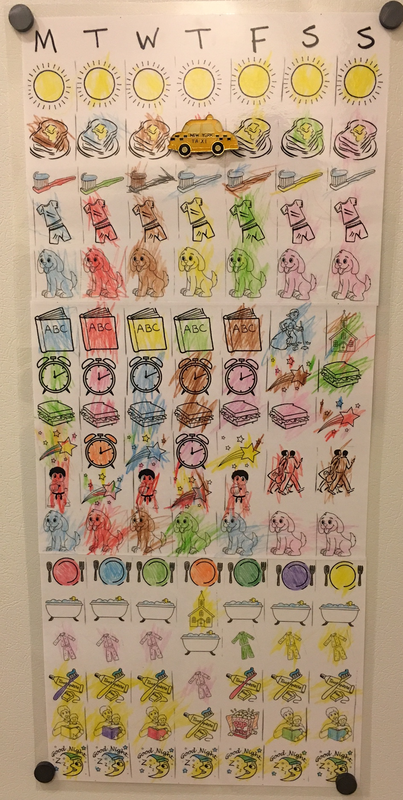 The tedious part was figuring out what size to print the pictures, how to arrange them on paper, and then come up with a finished product that we could color together.